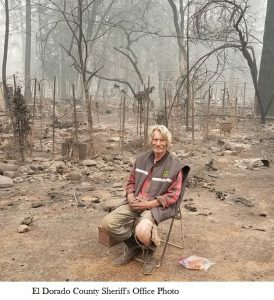 I live in Chico, down the hill from Paradise, devastated by the deadliest wildfire in California history. As a psychologist treating severe trauma since 1970, I’ve been asked how to help our friends and neighbors handle the emotional impact of this disaster. Feeling helpless during a disaster is naturally and severely traumatizing. Helplessness in the face of death and destruction challenges all of our emotional resources. Nobody is immune, even First Responders and Combat Veterans; we’re all human. We all have the same neurobiology. Severe trauma on which we ruminate can lead to Posttraumatic Stress Disorder. So, why is it that most severely traumatized people don’t develop PTSD? How a traumatized person’s brain handles the trauma memory makes the difference. Knowing how your brain handles trauma memories will allow you to help others. For a few hours after a traumatic experience is shared with you, the trauma memory is slightly malleable. For a little while, after a trauma memory is shared with you, it can be modified. And this cuts both ways. Every time your friend shares their trauma memory, how you handle it can make it better or make it worse. Emphasizing the terror of their trauma will increase the memory’s emotional salience, its punch in the gut. So, how do we help our friend without making it worse? Affirmative listening requires you to get beyond yourself and become fully available to your friend; listening so that you can deeply hear and affirm their experience. Affirmative listening means that you don’t have an agenda to fix your friend. Affirmative listening means that you commit to understanding your friend, without fully understanding their trauma. You can’t unless you were there. Their trauma is their trauma. You are making your safe presence available to your friend’s traumatic past. You are making your heart available to your friend’s heart. As your friend shares their traumatic memory, acknowledge their experience AND affirm their current safety and security. … is how I how I respond when a trauma victim comes to me for counseling. … is the kernel of their eventual recovery. … harnesses our interpersonal neurobiology, to modify the memory’s impact. … interrupts trauma rumination, so the memory becomes less firmly consolidated. … helps to gradually uncouple the emotions from memory. … helps to pull our friend’s awareness out of the past and back into now. … is how you help your friend stop the trauma from developing into PTSD. Don’t one-up each other in “war stories.” If you can share your story healthfully, that’s OK, but don’t ramp-up the emotional salience of the memory; you’re there to listen and affirm your friend’s current safety. What if my friend keeps ruminating and seems to be stuck in the trauma? Even with affirmative listening, professional help may be necessary. Find a well-trained professional and help your friend get connected. Psychology Today offers a geographic database that you can search: https://www.psychologytoday.com/us/therapists. Thanks for being so concerned about your friend.